The Brittany Backpack features a changing pad, inner dual bottle pockets and two insulated exterior pockets that will keep bottles warm or cold for up to four hours. I used a regular backpack as a diaper bag for both of my children. I didn’t want to buy another piece of baby paraphernalia, and I also didn’t want to look like a dork carrying an ugly diaper bag. That being said, I was always envious of my friends that had diaper bags with many pockets and a changing pad. Makes Mothering a Breeze. The Brittany Backpack is a fresh take on hands-free mothering that makes life a breeze with its’ customizable styles and modern mommy amenities. The Brittany Backpack features a changing pad, inner dual bottle pockets and two insulated exterior pockets that will keep bottles warm or cold for up to four hours. It can be worn as a backpack, shoulder bag, handbag or hung over the stroller. I do think it is neat that this bag can be worn as a shoulder bag or backpack. It is made of cotton and polyester, so it is not all natural, I also think $99 is a bit expensive, but remember, I used a backpack I already had as a diaper bag. It was not an extra expense I could justify, but it would make a nice gift for new parents. I like the pattern on the bag, as I think it something even Dad would not be embarrassed to carry. The bag is to spot cleaned. One other benefit of my backpack was being able to throw it in the washing machine, and I still use the same backpack today for other purposes. 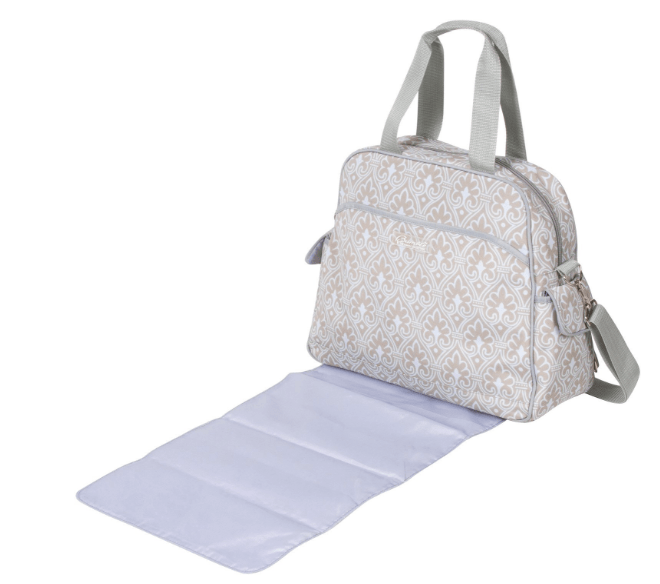 Do you need a diaper bag? Maybe. It depends. Lots of pockets are convenient, and it is nice to have a dedicated bag to grab when headed out the door. This bag is made in China. Green Craft: Fun With Plastic Bottles! Do Natural Dishwasher Detergents Actually Work? An Eco Child's Play Experiment: Lead in Backpacks? Are Your Kids Allergic To Food – Or What’s In It?